The US Senate has just voted in favor of REVERSING the #NetNeutrality rollback which Trump FCC chairman, Ajit Pai put in place. This is a major win for the internet, Net Neutrality, and the American people. BREAKING: We just won the vote in the Senate on #NetNeutrality. Thanks to everyone for pushing so hard. We have more work to do but this is an excellent beginning. The House still has to vote, and it's a long shot. Trump can veto. But our courts could overrule that. You can re-watch the vote here [CSPAN]. Senate and House Democratic response, below. Single most valuable thing from today's #NetNeutrality vote is seeing who's bought and paid for. Thune on the politics of the net neutrality CRA vote: "We are having a fake argument," John Thune, the Republican of South Dakota, said about the vote. He said the Senate "is going no where, my colleagues on the other side know that." 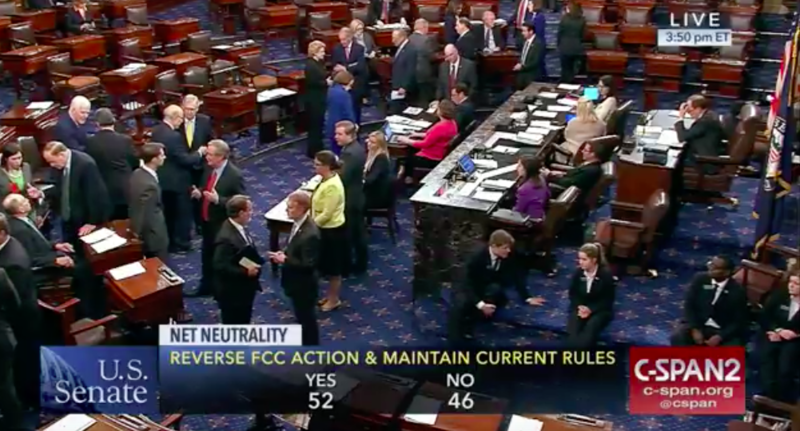 HISTORIC: Senators are voting right now on the #NetNeutrality CRA resolution. As of today, we'll have an official record of which lawmakers are on the side of big corporate ISPs when it comes to our digital civil rights. The Senate vote is rolling in as we speak (watch: https://t.co/yhadmYog6i).